Acknowledged author American Psychiatric Association wrote Diagnostic and Statistical Manual of Mental Disorders, 5th Edition: DSM-5 comprising 991 pages back in 2013. Textbook and etextbook are published under ISBN 0890425558 and 9780890425558. 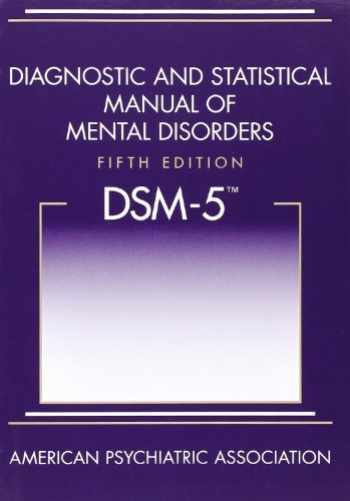 Since then Diagnostic and Statistical Manual of Mental Disorders, 5th Edition: DSM-5 textbook received total rating of 4.5 stars and was available to sell back to BooksRun online for the top buyback price of $5.23 or rent at the marketplace.